Nikon | Imaging Products | Best of the Rest / Nikon Family Cousins, Part 18 : "NIKKOREX 8"
Home > Products & Support > Imaging Products > History > Camera Chronicle > Part 18 : "NIKKOREX 8"
Part 18 : "NIKKOREX 8"
NIKKOREX 8 (See photo) was released in September of 1960, the same year as NIKKOREX 35, a lens-shutter SLR camera (See Part 1.) was released. Nippon Kogaku K.K. 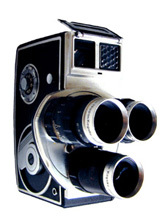 which was dedicated in still camera manufacturing entered into the home-movie camera market. And that it had a unique book-shape appearance with specifications for a beginner......it was a shocking debut for that period. Nippon Kogaku, at those days, was trying hard to expand its selection of products. NIKKOREX series including above-mentioned NIKKOREX 35 formed a part of that movement and NIKONOS taken up for a subject last time (Part 17.) was followed that policy too. Entering into 8 mm home-movie camera was also according to that movement. "From still to movie" sounds like a big change, but it actually wasn't for Nippon Kogaku. It had a long experience of supplying lenses for 16 mm and 8 mm movie cameras with various manufacturers. It was a present OEM (Original Equipment Manufacturing) business and because of that experience, the cine camera market was not "entirely strange world" to it. 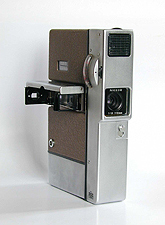 NIKKOREX 8 was sold as a beginner's model, quite unusual for Nippon Kogaku, but the fact is that an 8 mm cine camera with quite another concept was prototyped before. It is known that the design of that prototype was started in 1956 and finished in 1959. Judging from the photograph of the prototype (see photo) that is kept even now by Nikon, it was quite a high-performance model. Three taking lenses, CINE-NIKKOR 6.5 mm f/1.8, 13 mm f/1.8 and 38 mm f/1.8 can be interchangeably rotated by a turret. 6.5 mm lens has a fixed focus but other two lenses can make the distance adjustment with a helicoid. Film is driven by a spring and its speed can be changed from 16 frames per second to 64 frames per second (fps. ), and such special shooting as slow-motion (high-speed) shooting can be made. Viewfinder is a direct optical view finder of which magnification changes in linkage with a switchover of the turret, and in addition it has a built-in selenium-cell, match-needle meter that controls the exposure in linkage with the stop value and the shooting speed. A very interesting feature is a film loading method. 8 mm movie in those days was called "double 8" that used film of 16 mm wide and after first 25 feet (about 7.6m) was finished, film was taken out and the take-up reel and the supply reel were reversed and the shooting was made with rewinding the film. The right and left half of the 16 mm wide film were shot in both ways of going and coming. This reversing operation is very troublesome and the reel was often dropped and the film was exposed. 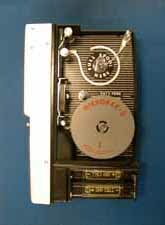 As a countermeasure, this prototype adopts the method of loading an exclusive film magazine that is loaded with film in advance. When the first 25 feet was finished to shoot, the entire magazine is taken out and turned upside down and loaded again. This magazine is very elaborately designed. 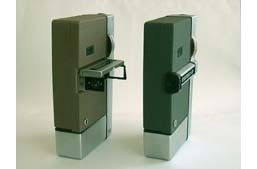 A light shielding shutter was provided at the location of shooting frame and was opened and closed in accordance with the key operation of opening and closing of the cover for film loading. Anyway, the planned and prototyped 8 mm cine camera at first was a high-class model that was very like that of Nippon Kogaku. I've heard that the object of this development project was "To provide high image quality of 16 mm professional cine camera with 8 mm cine camera". Such a high-class-model-oriented prototype suddenly made a complete change to a beginner's model like "NIKKOREX 8". 3-lens turret was changed to only one fixed-focus 10 mm f/1.8 lens and shooting speed was simplified to 16 frames per second only. Driving by a spring was changed to driving by an electric motor, coupled exposure meter to automatic exposure, and above all, the orthodox appearance to unconventional book-shape appearance. It is partly due to the cost increase of the first prototype but partly due to the strong intention of development. Perhaps there was a man of strong conviction who believes that "8 mm cine camera must be like this !" and he must have taken a leadership of the development. A designer who took part in this development and lately retired at the retirement age recollected, "In my long experience of development, there was no project that had such clear concept like this." In fact, the basic policy of "push a button and high image quality can be obtained by everybody", "ultra compact and light weight", "low price", "simple is the best" was never changed to the end and various requests for specifications to add this function and that proposed by his boss and other seniors were all declined. It is quite interesting to know why a drastic change of policy like this was made and who was the man of strong belief, but to my regret it is unknown. However, it is sure that such clear concept was favorably accepted by the market. 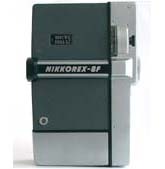 NIKKOREX 8 became a favorite model and enjoyed rather large production, for that time, of 3,000 units per month, and its book-shape appearance was followed by many other makers and it was typical of introductory model of 8 mm cine camera including a later "Fujica Single 8(PI)" (1965 Fuji Photo Film). In the "NIKKOREX 8", the most advanced technologies of that time were actively adopted. One of them was the driving of film by an electric motor (using four size 1.5V R6-type ("AA"-size) batteries). It was the time when the film driving of 8 mm cine camera was being shifted from spring driving to motor driving. Though this technology was not quite well appreciated, this camera actively adopted it. On the contrary, it can be said that the down-sizing to that extent was made possible by this shifting to motor driving. It is also worthy of special mention that CdS (cadmium sulfide) was adopted as the photocell. That was the first attempt to build a CdS in a camera body, including a still camera. The auto exposure of 8 mm cine camera was made in the way that one or two aperture stop blades were fixed to the axle of indicator of galvanometer of exposure meter and the aperture of taking lens is directly controlled by the swing of indicator of galvanometer. In this case, although the stop blades were made as light as possible, it was quite a load for the axle of index of galvanometer. On the other hand, if the exposure control could not follow swiftly the variation of the brightness of the scene made, for instance, by panning, the screen image would be awkward. In order to prevent that, it is required to increase the driving power for stop blades with applying sufficient current to the galvanometer, and in that sense, CdS photocell was most suitable as it has much larger output current than selenium cell. Since then, CdS was used for most built-in exposure meter of still as well as cine cameras, and exposure control in even darker scene could be made possible and was bridged over to TTL metering. In that sense, NIKKOREX 8 that incorporated CdS for the first time played an important role. As mentioned before, the NIKKOREX 8 acquired rather wide popularity. 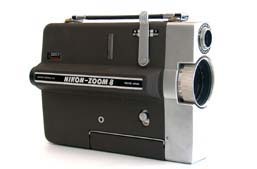 Then Nikon Zoom 8 and its junior model NIKKOREX 8F were released in 1963, following the trend of adopting a zoom lens for 8 mm cine camera. However, it was up to that time that the original concept of "compact and simple camera" was faithfully succeeded. 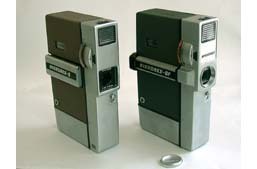 With the shift from "double 8" film to "super 8" film, 8 mm cine camera of Nippon Kogaku stepped to higher grade gradually.